Another month, another issue of ACTION COMICS. 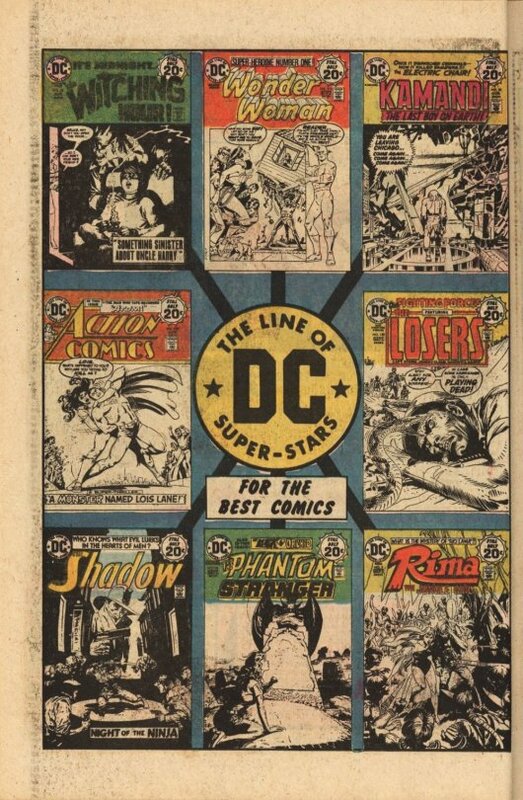 This was still during the days in which many or even most comics, DC ones in particular, weren’t released monthly. My beloved FLASH was bimonthly, and just about to increase to 8 times a year. JUSTICE LEAGUE, likewise, was bimonthly. Even SUPERMAN was only 8 times a month. As such, it was ACTION COMICS that was the most consistently-released title that I was reading. This issue features another straightforward story by Cary Bates that revolves around a single gimmick, with some lovely art by Curt Swan and Bob Oksner. It’s an art combination that I really like, as Oksner adds an appealing softness to what Swan does without losing the solidity of the figures and forms. He also did great women, which was a benefit in a story that was going to focus so much on Lois Lane. 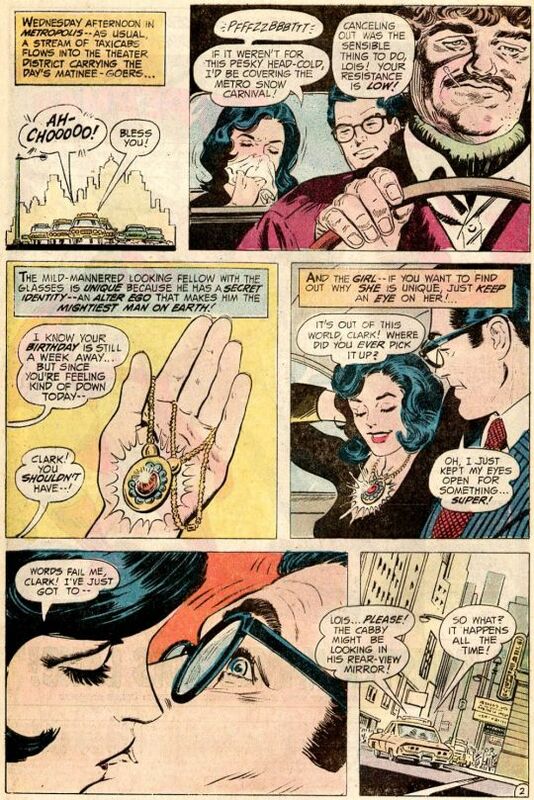 It all starts when Clark Kent gives Lois Lane a gift for her birthday: a necklace made from an alien gem. Surely you’d think Superman would know better by now–but apparently not. 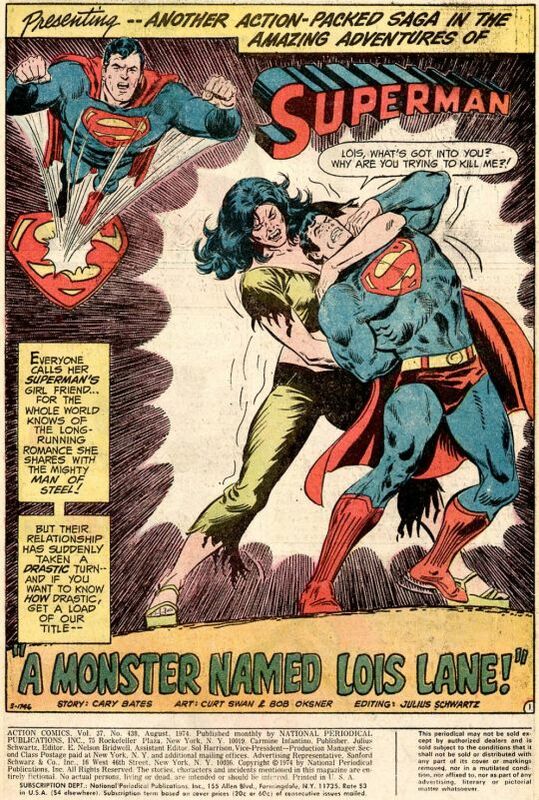 In any case, the necklace causes Lois to transform into a rampaging caveman-like monster as powerful as Superman. She’s on the loose, out in the world, with gossip reporter Lola Barnett working to break the story of the creature’s true identity. 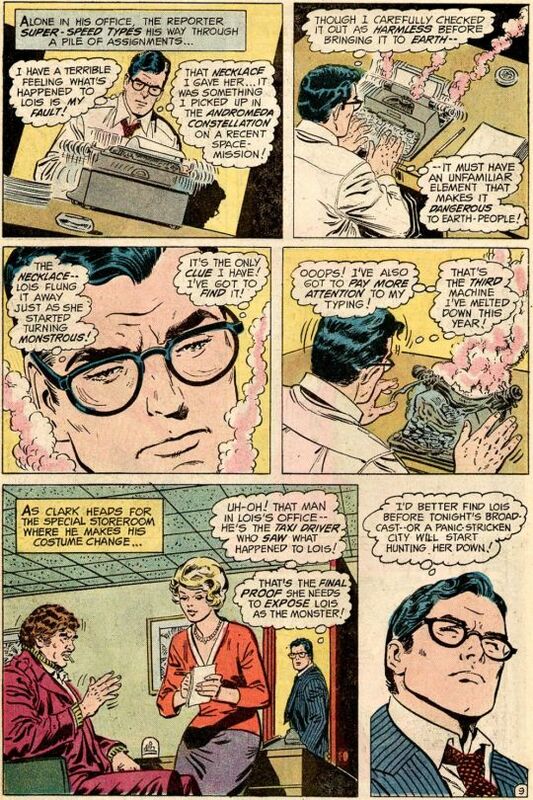 Clark is so worried about Lois that he absent-mindedly pounds a typewriter into molten scrap. But he catches a glimpse of the monster Lois stalking him, and that gives him an idea. 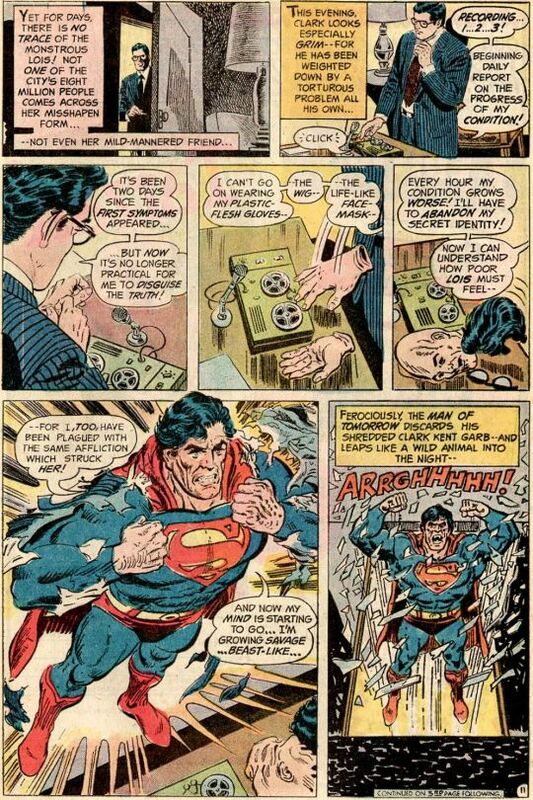 Alone in his office, Clark strips off his plastic face mask, flesh-colored gloves and explodes out of his blue suit, revealing that he too has been infected by the gem from space, and transformed into an inhuman creature. 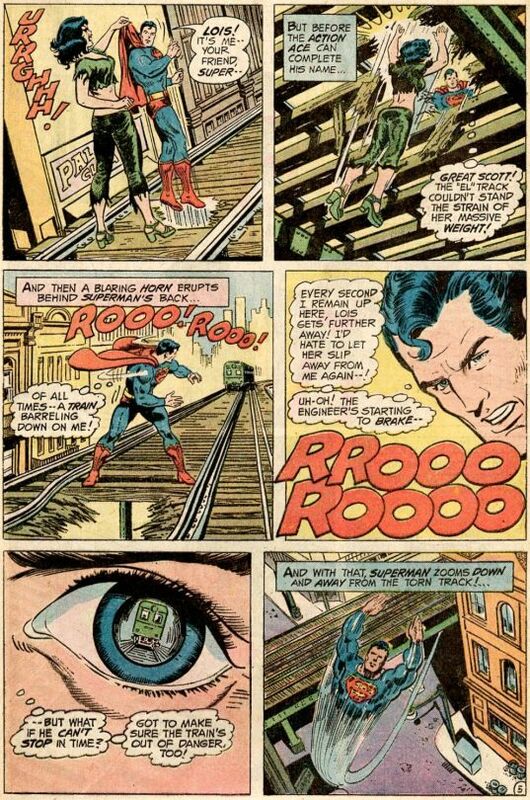 The caveman-Superman stalks the city streets, until his path eventually brings him into contact with creature-Lois. Unfortunately, beast-Lois sees through Superman’s ruse virtually instantly: he’s not infected, he’s just disguised himself as a similar creature to draw her out. 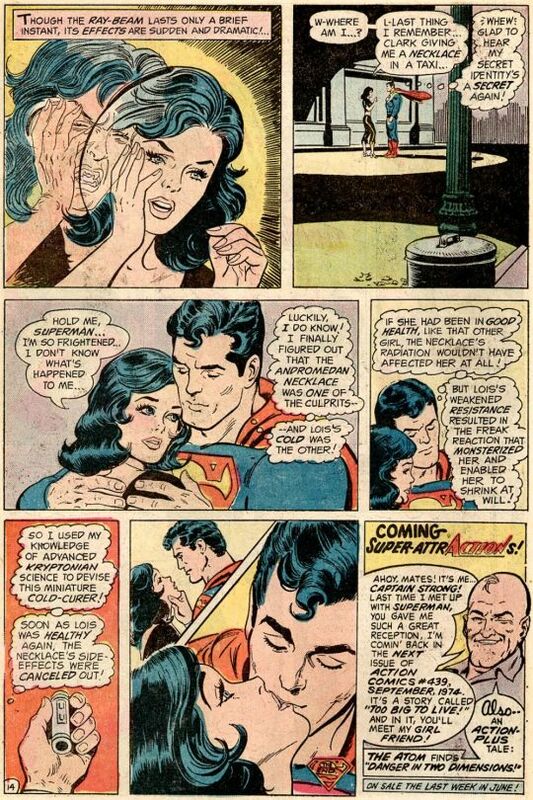 Luckily for Lois, he has the cure for her condition–which is also the cure for the common cold. Turns out that Lois’s cold weakened her resistance to the gem’s alien radiations, bringing about her transformation. This ending does raise a question, though: if Superman has a Kryptonian cure for the common cold, why doesn’t he share it with the world? That said, given his gift-giving this issue, maybe that’s for the best. And Ahoy, next issue will feature the return of Captain Strong, whoever that is! (I hadn’t read the Captain’s previous ACTION appearance.) But next up, a tale of the Atom in which a scientist abducts lawyer Jean Loring in an attempt to get his hands on the Tiny Titan. The Professor threatens to erase the tape if the Atom won’t give him the secret of size-control. 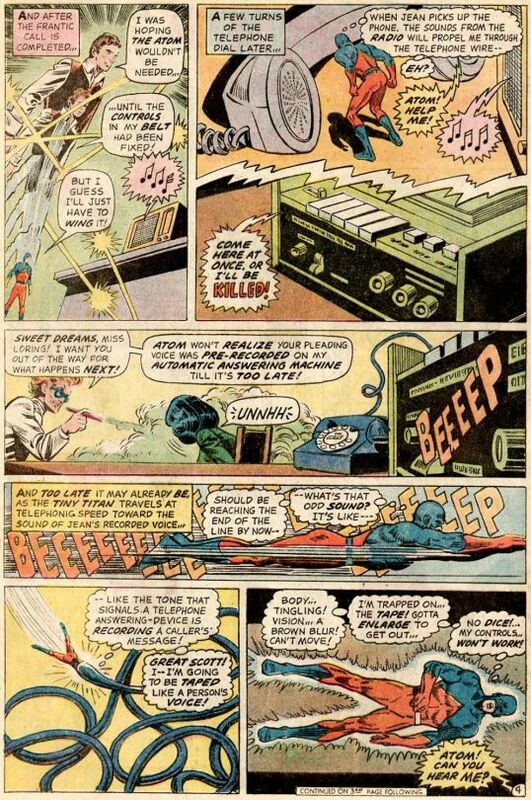 Instead, the Atom fiddles with his size-controls, grows, bursts free of the tape and slugs the villain. The bad guy is thereafter incarcerated–nobody seems to care that he’ll have shrunk away to nothing before he can come to trial. 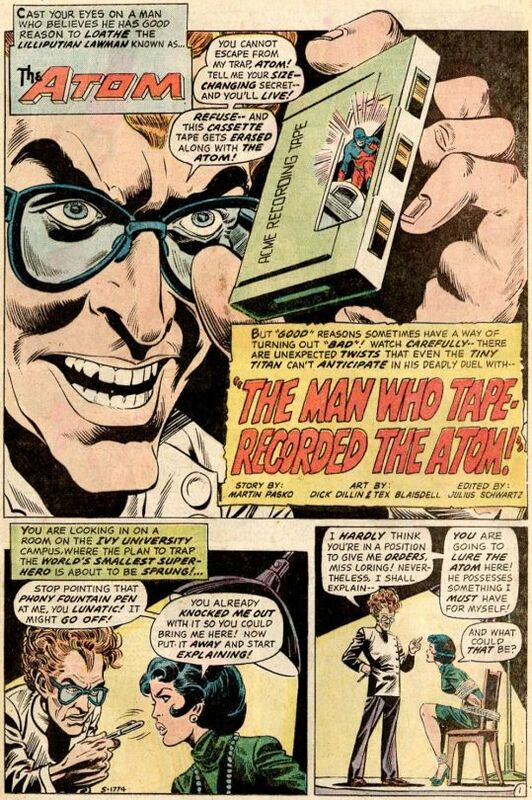 But it’s all good, as in the final panel the Professor reveals that he wanted the Atom to catch him, that he’ll be escaping via his secret super-power, and that the story will be continued next month! All across this month, the DC books had been carrying this ad, and they did similar ones in months past. While most of these books weren’t of any great interest to me, not being super hero titles, the images remained vivid. that KAMANDI cover is a classic of drama, and I don’t know that there’s a better “whole-story-in-one-image” cover than that LOSERS piece. So this ad didn’t make me buy or seek out comics I wasn’t ordinarily reading, but it did make an impact on my psyche.